Magnesium is the lightest of all metal elements and is primarily used in structural alloys due to its lightweight, strength, and resistance to corrosion. There are over 60 different minerals known to have a magnesium content of 20% or greater, making it the eighth most abundant element in the earth's crust. But when water bodies are accounted for, magnesium becomes the most abundant element on the surface of the earth. That is because of the significant magnesium content in salt water, which averages about 1290 parts per million (ppm). Yet, despite its abundance, global magnesium production is only about 757,000 tons per year. Magnesium's characteristics are similar to its sister metal aluminum. It not only has the lowest density of all metal elements, making it the lightest, but it is also very strong, highly resistant to corrosion and easily machinable. 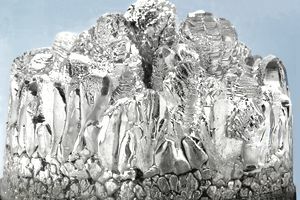 Magnesium was discovered as a unique element in 1808 by Sir Humphrey Davy but not produced in metallic form until 1831 when Antoine Bussy made magnesium during an experiment with dehydrated magnesium chloride. Commercial production of electrolytic magnesium began in Germany in 1886. The country remained the only producer until 1916, when military demand for magnesium (for flares and tracer bullets) led to production in the US, Great Britain, France, Canada, and Russia. World magnesium production dropped off between the wars, although German production continued in support of Nazi military expansion. Germany's production increased to 20,000 tons by 1938, accounting for 60% of global production. In order to catch up, the US supported 15 new magnesium production facilities, and by 1943, boasted a production capacity of over 265,000 tons of magnesium. After World War II, magnesium production fell again as producers struggled to find economical methods to extract the metal in order to make its price competitive with the cost of aluminum. Depending upon the location and type of resource being used, a wide variety of production methods can be used to refine magnesium metal. This is due both to the fact that magnesium is so abundant, making production in many locations possible and to the minor metal's end-use applications being so price sensitive as to encourage buyers to constantly seek out the lowest possible cost source. Traditionally magnesium is produced from dolomite and magnesite ore, as well as magnesium chloride containing salt brines (naturally occurring salt deposits). Because of its similarities with aluminum, magnesium can be used as a substitute for many, if not most, aluminum applications. Magnesium is still, however, limited by its extractions costs, which make the metal about 20% more expensive than aluminum. Due to import tariffs on Chinese-produced magnesium, US magnesium prices can be almost double that of aluminum. Over half of all magnesium is used in alloys with aluminum, which are valued for their strength, lightness, and resistance to sparking, and are widely used in automobile parts. In fact, various car manufacturers use cast magnesium-aluminum (Mg-Al) alloys to produce steering wheels, steering columns, support brackets, instrument panels, pedals and inlet manifold housings, among numerous other parts. Mg-Al die castings are further used to make transmission and clutch housings. High strength and corrosion resistance are critical to aerospace alloys, as well as helicopter and race car gearboxes, many of which rely on magnesium alloys. Beer and soda cans don't have the same requirements as aerospace alloys, yet a small amount of magnesium is used in the aluminum alloy that forms these cans. Despite using only a small amount of magnesium per can, this industry is still the largest consumer of the metal. Magnesium alloys are also used in other industries where lightweight, sturdy alloy applications are crucial, such as in chainsaws and machinery parts, and in sporting goods like baseball bats and fishing reels. Alone, magnesium metal can be used as a desulpherizer in iron and steel production, as a deoxidizer in the thermal reduction of titanium, zirconium, and hafnium, and as a nodularizer in the production of nodular cast iron. Other uses for magnesium are as an anode for cathodic protection in chemical storage tanks, pipelines, and ships, and in the production of flare bombs, incendiary bombs, and fireworks. USGS. Mineral Commodity Summaries: Magnesium (2011).